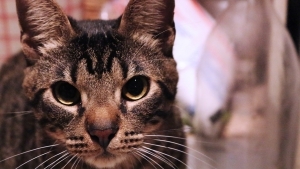 Whisker fatigue has been making the rounds online after an article published in the New York Times stated it could be the reason why some finicky cats struggle to eat out of bowls. When they lower their heads into the bowl, the article explains, their ultra-sensitive whiskers come in contact with the sides, resulting in repeated stress. It’s a real thing, promises Dr. Catsby’s, a website that sells whisker-friendly and ergonomic food bowls. But even the most fanatic cat-people are skeptical of this claim. After all, states this opposing article, the phenomenon has never been acknowledged or backed by veterinarians, animal medical centers, or research labs focusing on cat disorders. The problem? While there’s no harm in theorizing about picky cats, there is a growing concern that putting a name on something unproven could result in cat owners assuming whisker fatigue is to blame for appetite loss, rather than seeking proper medical care. The takeaway lesson? Felines with a decreased appetite should always be taken to the vet, whisker theories aside. What are your thoughts on whisker fatigue? Please share in the comments below!